I think this might just be my favourite breakfast ever. Bold statement, but it’s deffinitely worth the praise. 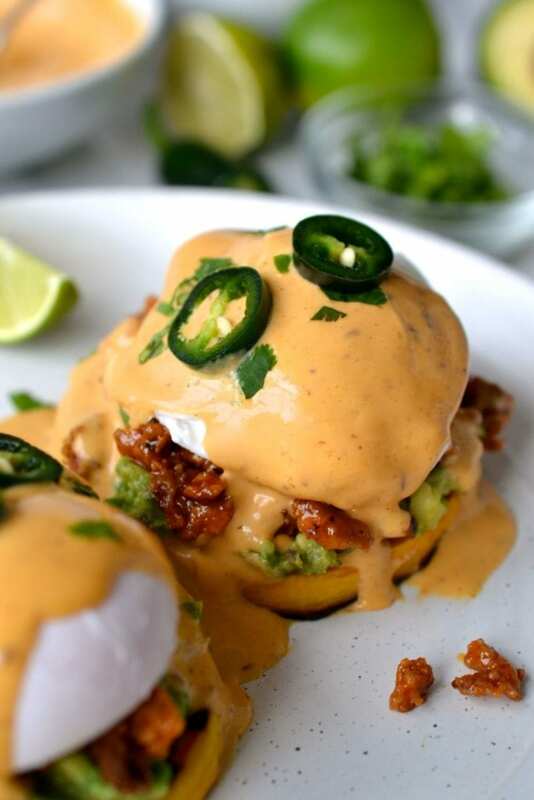 I love going out for brunch on Sunday mornings, and I am always guaranteed to order one of two things, Eggs Benedict, or something Mexican inspired. 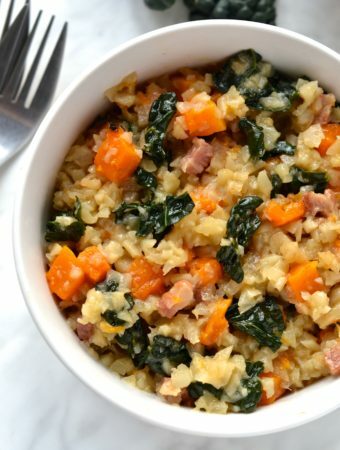 Now that I have figured out how to combine these two things into one incredibly delicious dish thats easy to make, I’m never eating brunch out again. 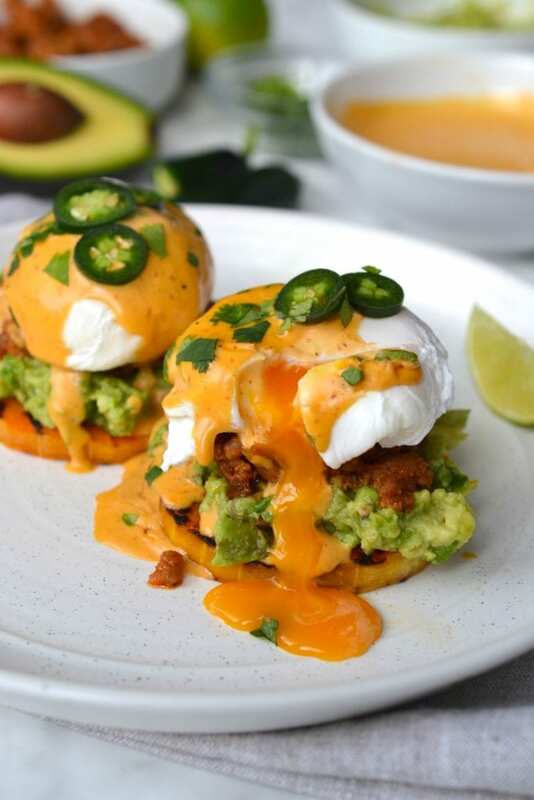 I find that Hollandaise can often be too rich and buttery, so for this recipe I created a much lighter tasting sauce that is packed with spicy chipotle and a refreshing kick of lime. 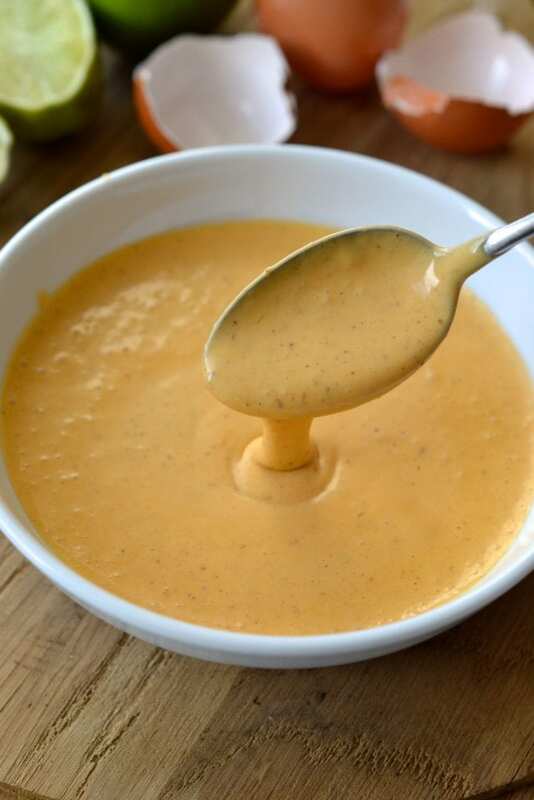 The hollandaise can be made with an immersion blender or regular blender and is much easier and faster to make then traditional hollandaise which can require a bit of technique. 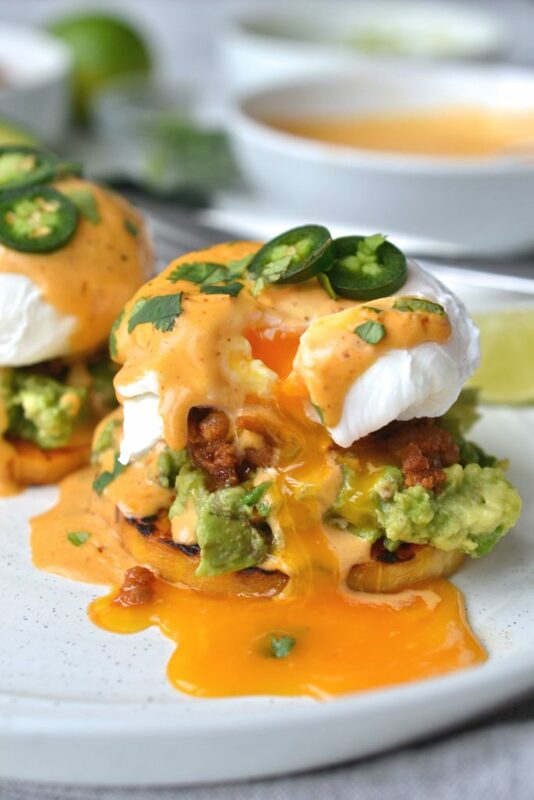 For the base of these eggs benedict I used grilled slices of butternut squash, but sweet potato slices would also work well. 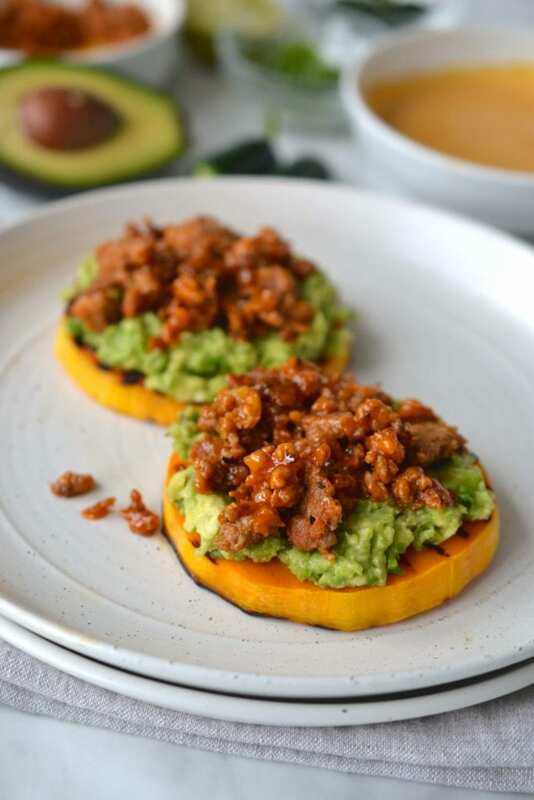 Each slice is topped with smashed avocado, and spicy chorizo. 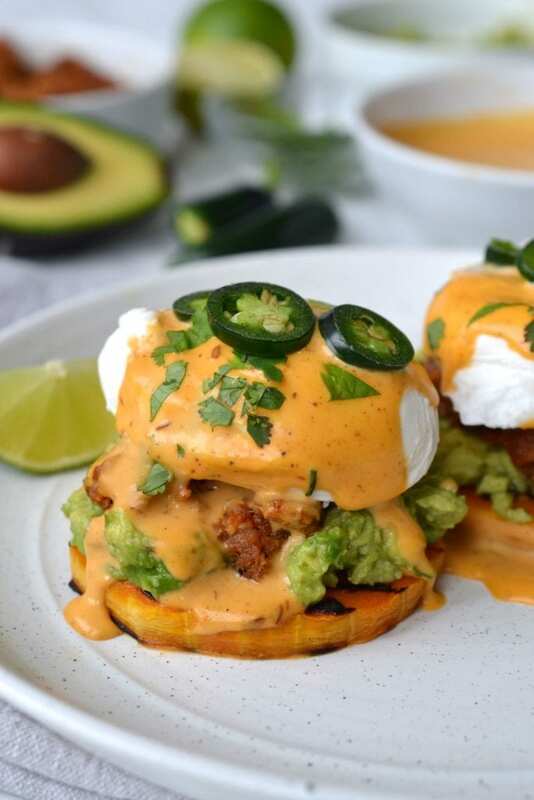 I used homemade ground chorizo, but you could also use chorizo halved sausages if you prefer.They are finished off with a poached egg, a drizzle of chitpole hollandaise and slices of jalapeno to create one seriously delicious breakfast. Although it seems like there is a lot of components, this dish comes together quite quickly. 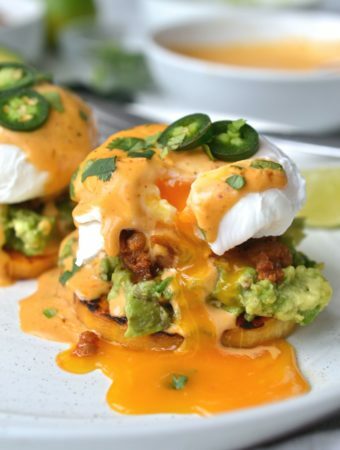 If you aren’t a fan of cooking in the morning, you could grill the butternut squash, cook the choirzo and make the hollandaise the night before and then simply poach the eggs the following morning. 1 large avocado (smashed with a fork. Peel a butternut squash and cut the long neck into slices approximately 1/2 inch in thickness. Heat a grill to medium high heat. 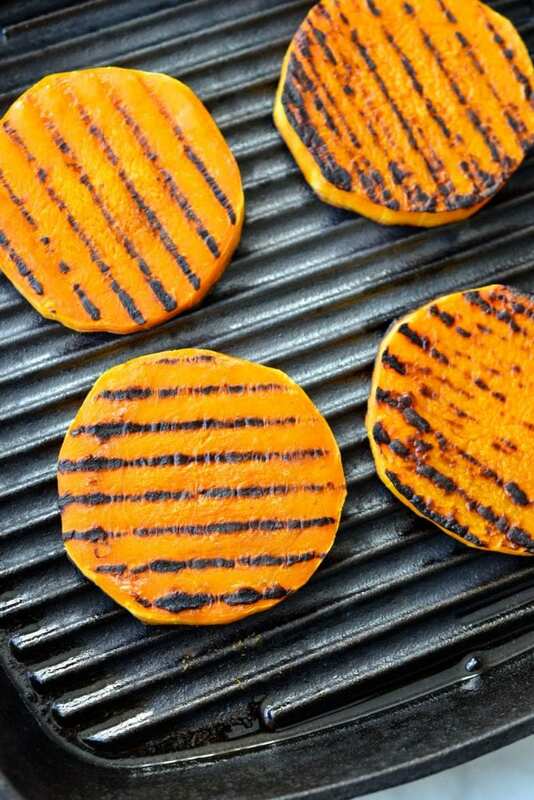 Brush each butternut squash slice with olive oil and grill the slices for approximately 5-6 minutes per side until grill marks appear and the squash is slightly tender. Transfer the slices to the oven set on very low heat to keep them warm while you prep the rest of the recipe. 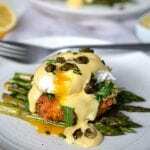 To make the hollandaise, in a tall container add the egg yolks, salt, lime juice and chipotle paste. Insert an immersion blender into the. container and blend for 30 seconds. Very slowly drizzle the melted ghee into the container while blending. This could also be done in a blender if you do not have an immersion blender. 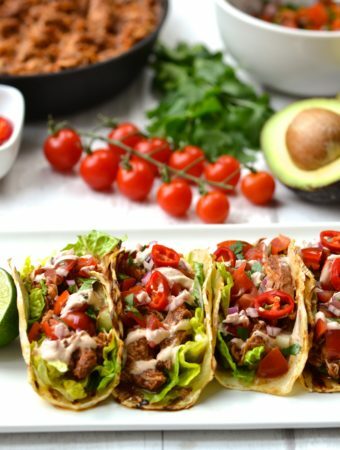 Cook the ground chorizo meat in pan, breaking up the meat with a fork into a crumbly texture. 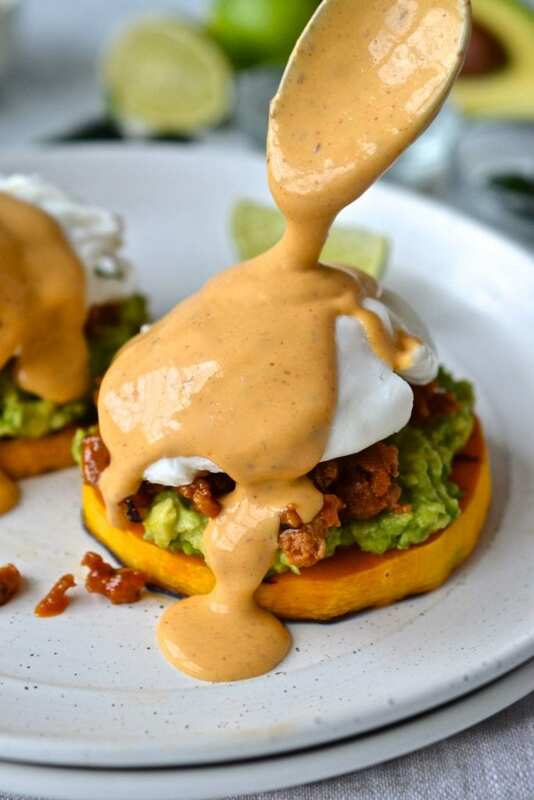 To assemble place two butternut squash on a plate, top each slice with smashed avocado, some of the chorizo meat, a poached eggs and spoon the hollandaise overtop. Garnish with jalapeños and cilantro before serving. 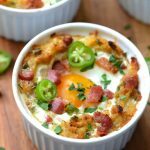 I pretty much NEVER comment on recipes, but this one I had to. OMG. 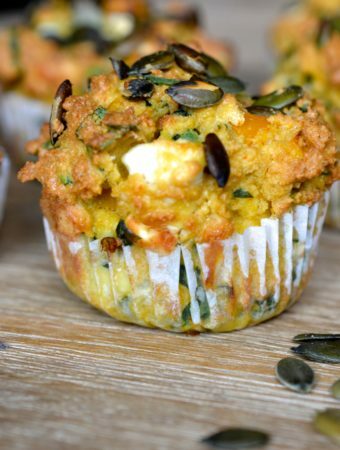 The only change I made was using sweet potato instead of squash. 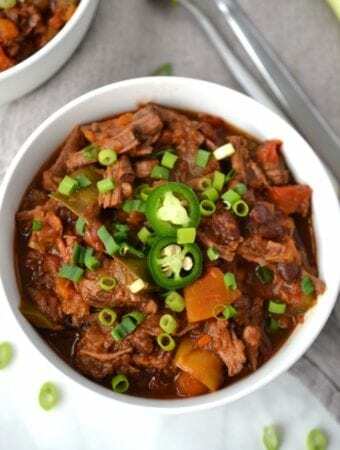 My husband and I LOVED this recipe, and I’m adding it to our regular rotation. Everything about it was beautiful and well-balanced. Thank you for this recipe! I have never made a comment online before, and I use tons of online recipes. This one was well worth the time to provide input. 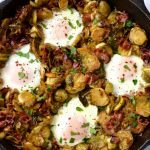 I made this for Sunday Brunch for two of my kids who are home for Spring Break. Since my daughter is vegetarian, I used the Trader Joe’s chorizo. 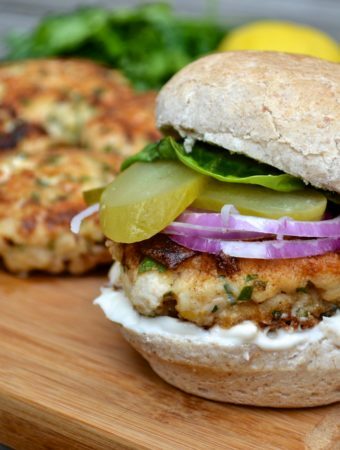 It was OUTSTANDING, and this recipe has made the ‘definitely make again’ list. Great job on this and thanks for sharing! How many does this make? 4? 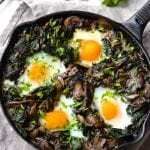 Do you eat the egg yolks raw? It doesn’t say anything about cooking them anywhere in the recipe. 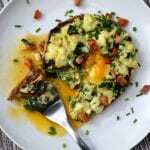 Yes for the hollandaise they are added in raw. Just made this and LOVED it!! May never go back to regular eggs benedict again. The squash as base was lighter yet still totally filling. Yum! Is apple cider vinegar OK to sub for white vinegar? Yes that would work too!